For Sevmash shipyard in Russia's northern city of Severodvinsk, 8th June 2012 was a special day as a giant aircraft carrier built by this shipyard for Indian navy, took to the sea for the first time on this day for pre-delivery sea trials. 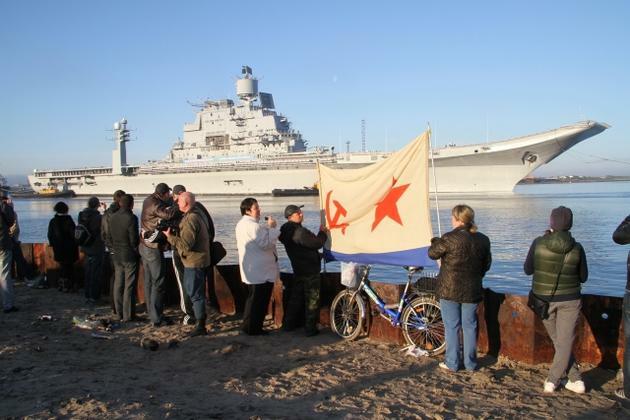 A former Soviet heavy aviation cruiser, 'Admiral Gorshkov' has been converted by this shipyard into a regular aircraft carrier and has been named as 'Vikramaditya'. Originally this Kiev class ship, was a combination of a cruiser and a carrier with an island superstructure and a 2/3 length angled flight deck on starboard. The foredeck was provided with heavy missile armament. This arrangement has now been modified into a full length angled flight deck to make Vikramaditya a full fledged aircraft carrier. The sea trials, which would take place in the arctic sea would continue for 120 days. The programme of tests, which mainly consists of trials in testing aircraft takeoff and landing, is expected to be very tight as deck aviation can operate only from June to September in the harsh cold conditions of the Arctic seas. For carrying out Test flights, landings and take off procedures, two types of Russian aircraft — MiG-29K and MiG-35 — flown by Russian pilots would be used. Russia has already delivered to the Indian Navy, 12 MiG-29K single-seat aircraft and 4 MiG-29KUB two-seater planes last year. It is planned that these aircraft would be deployed on Vikramaditya. Even for the indigenous aircraft carrier 'Vikrant' which is being built in India, same MIG-29 K deck fighters would be deployed. India has already placed order for these aircraft. Vikramaditya is being manned by a mixed crew for sea trials. 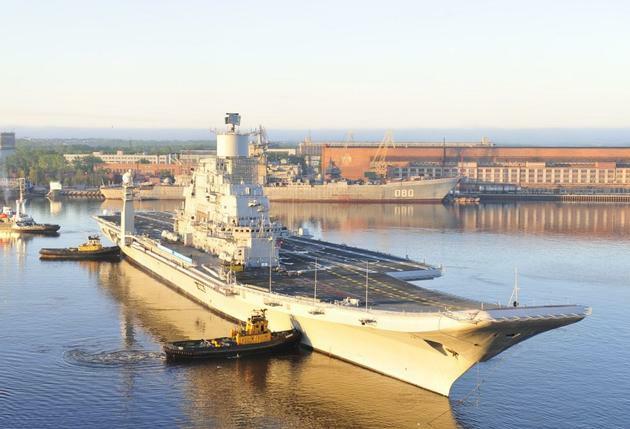 A section of the Indian crew, after completion of their training in Russia has joined the Russian crew for the first sea voyage of Vikramaditya. More sailor would be flown in from India later making total number of personnel on board to 2700. The crew strength required for normal operation of Vikramaditya is only 1350. On successful completion of sea trials, an Indian acceptance team would join the ship for final approval of the ship by India. After making final finishing touches, Vikramaditya is expected to be formally handed over to India on 4th December 2012. As the ship was being re-fitted, Indians imported some special equipments from India for installation on Vikramaditya. Six Masala Dosa-making and three Idli-making, fully automated machines, have been imported by Indian Navy along with eight wet grinders for grinding rice and other ingredients for batter,and have been installed on the aircraft carrier. These machines with fully automated technology can achieve assembly-line production of 400 Dosas and 1,000 Idlis in an hour on each machine. This means that 2400 Masala Dosa's and 3000 Idli's can be prepared for ship's 2,000 strong crew within just one hour. The technology for these machines has been developed by Mysore's Central Food Technological Research Institute (CFTRI) and manufactured by a private licensee. The technology was developed by the CFTRI in 1998 and is well proven by use in major industries where catering for a large workforce is needed. Such applications require mass production. 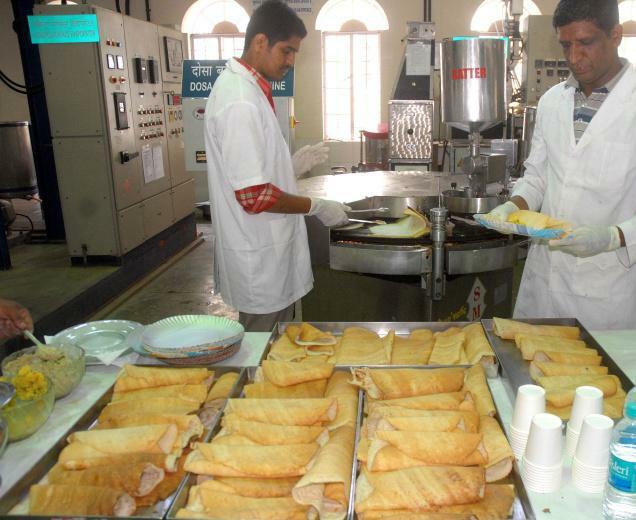 The machines have been so designed that they carry out of all operations pertaining to making a Dosa such as spreading batter to the requisite size, oiling, cooking and even dispensing curry and chutney. The automated technology also ensures that hygienic norms are observed in the kitchen. No manual labour would be required and Idlis and Dosas produced would be of uniform taste. A group of engineers from manufacturers of these machines have returned back from Russia after installing these machines on Vikramaditya. It will help serve traditional Indian delicacies to the Indian crew once the ship is commissioned. So, along with test flying MIG 29 aircraft from the carrier, the crew of the ship also can test whether Vikramaditya Dosa's are crisp or not and Idli's are delicious or a sticky mess. They say 'Army marches on its stomachs'. But it is true for navy, and air force as well. So good thing people get to eat if they have to stay away from land for a long time. They should also have facilities for tandoori chicken, makkai di roti, alu paratha, fish curry, batatewada, aluche phadaphade,kadhibhat, gulabjamun, rosogolla,gajar ka halwa, and such variety from all over India. I am sure there will be a huge entertainment center with private rooms. Given the vow of non-violence, it is not necessary to burden this ship with heavy, large sized arms or career soldiers. people from entertainment field can be brought in with huge fees, appropriate to their status. Then the ship can go to pacific, south of france, mediterranian etc. The runway is essential as ministers and other members of the ruling party and their relatives would want to visit this place for inspection, when the ship is in such locations.